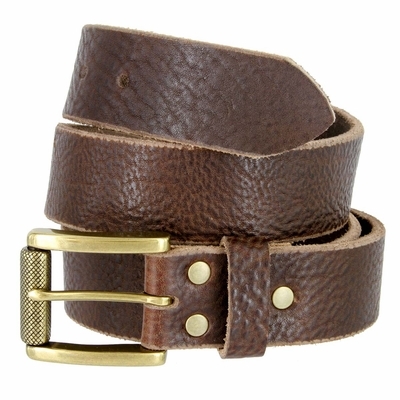 Hand Crafted in Anaheim California USA, Made of North American Full Grain Bullhide, Drum Dyed for lasting beauty accented with High quality, Heavy Antique Brass finish roller buckle on 1-1/2" (38mm) wide 4. 90 mm approximately . (3/16" approximately . ) thickness One Piece Genuine Full Grain Leather Belt. Hand cut made in USA, measured from where the leather ends at the buckle end to the middle hole at the tip end.